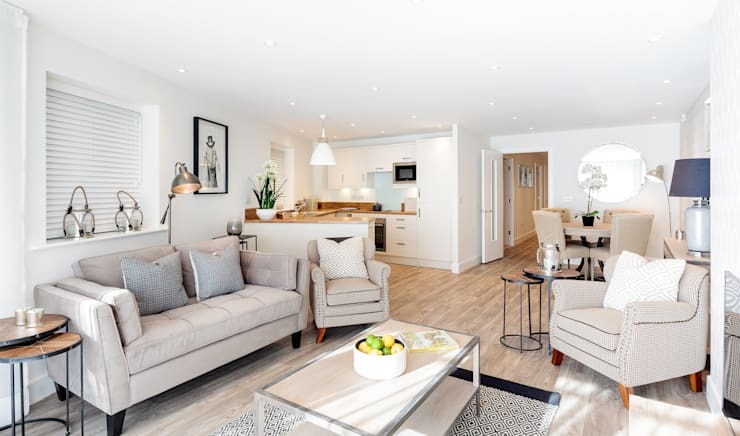 This stunning home is located in the quiet parish of Swanage on the southern coast of England, and presents one in a range of seaside villas designed and constructed by the creatives at WN Interiors. Compact and stylish, this home is sure to impress, and has been constructed as the perfect, modern locale for retirees to while away the days in the serenity of a coastal village. The interior is chic and modern, with an understated colour scheme prevailing throughout its sophisticated design. 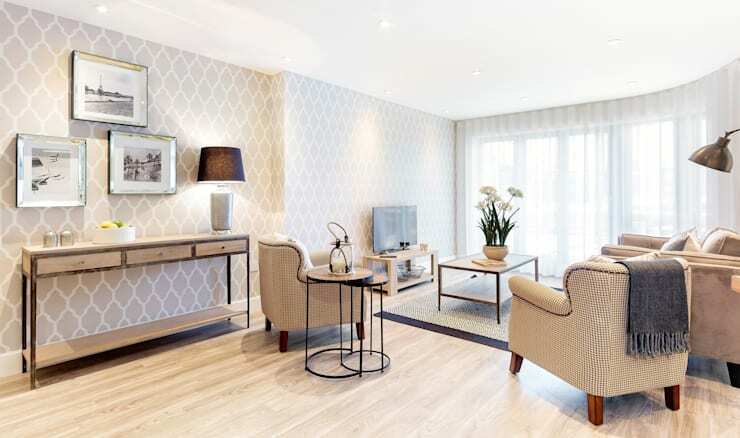 The living, dining and kitchen areas have been combined to maximise space, with pale tones and intricate patterns on show from the wallpaper to the upholstery. Natural light flows into the home through expansive windows, which also provide a gorgeous view of the beach beyond, illuminating the interior and bouncing about the soft hues of the decor. 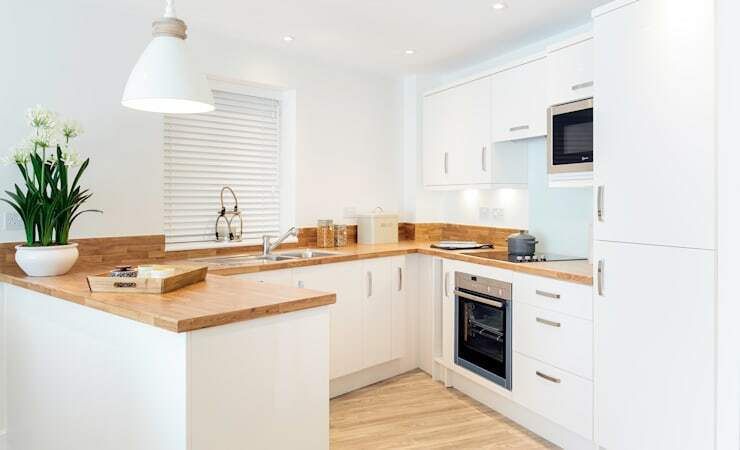 The kitchen is streamlined and contemporary, with hints of homely style added through the choice of kitchen accessories to charming effect, while the bedrooms are luxurious and inviting, with the master bedroom in particular impressing in its sense of comfort and hints of majesty. All in all this home present a wonderful getaway from city living, and has been designed to perfection to showcase a modern aesthetic. Take a tour below and tell us what you think! The living quarters of the home are open, modern and stylish, combining living, kitchen and dining spaces in a relaxed and inviting atmosphere. The muted tones of the furnishings are dressed up by patterned cushions and upholstery, and while the decor of white walls and ceilings anchored by pale floorboards contributes a sense of visual expansion within the home. Lighting is provided by a range of spotlights dispersed across the ceiling, with multiple, large lamps also included for more localised illumination. The design appears extremely liveable, with the furnishings, decor and colour scheme balancing in subtlety and style. An alternate view of the living area highlights the generous influx of natural light streaming into this home through its large, glass sliding doors. A soft, translucent curtain beautifully filters the sunshine, allowing it to bounce about room and subtly illuminate the range of understated tones therein, while the expanse of glass panels invite the occupants to admire a gorgeous view of the home's seaside locale. In the kitchen, the classic combination of wood and white has been harnessed to create a stylish, modern space. Ample storage has been provide, with multiple drawers and cabinets included, while the kitchen bench curtails the area, sectioning it from the living and dining spaces beyond. The sheen of stainless steel in the appliances and finishes adds a contemporary edge to the room, which is balanced by homely touches such as the tin bread box and potted Agapanthus'. The bathroom is dressed in sleek decor, evoking the earthy tones of brown and grey alongside the sheen of white, silver and glass finishes. 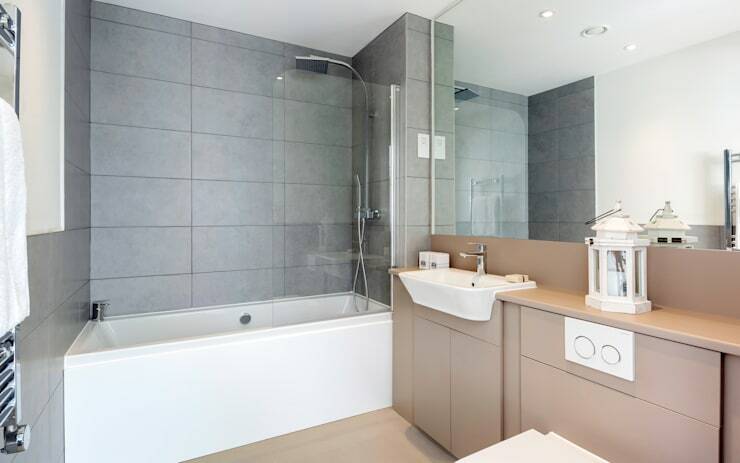 Compact and functional, this bathroom includes a combined shower and bath to cover all the bathing basics, with plenty of storage incorporated within the sink cabinets to ensure the sustainability of the room's sleek aesthetic. The master bedroom is resplendent in luxurious white, with the dazzling glow of the walls and ceiling echoed in the soft, clean hue of the queen-sized bed. The effect is broken only by the chic, black bed head and reflective surface of the wardrobe doors and full length mirror. 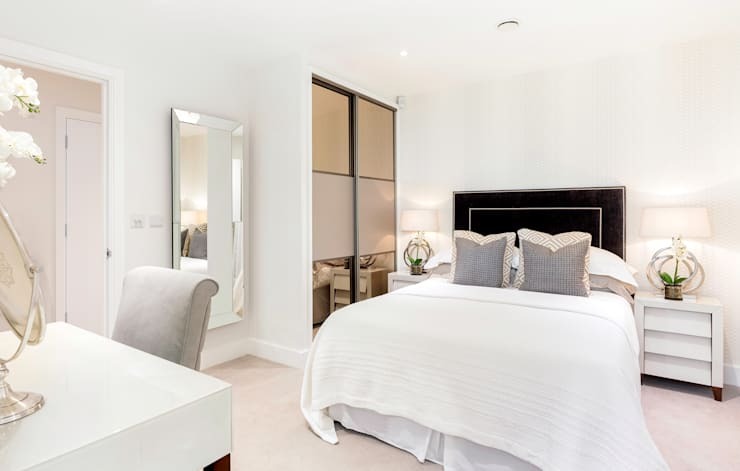 A small, contemporary dressing table with classic make-up mirror elevates the space with a touch of glamour, alongside an array of white orchids and the novel curves of the bedside lamps. 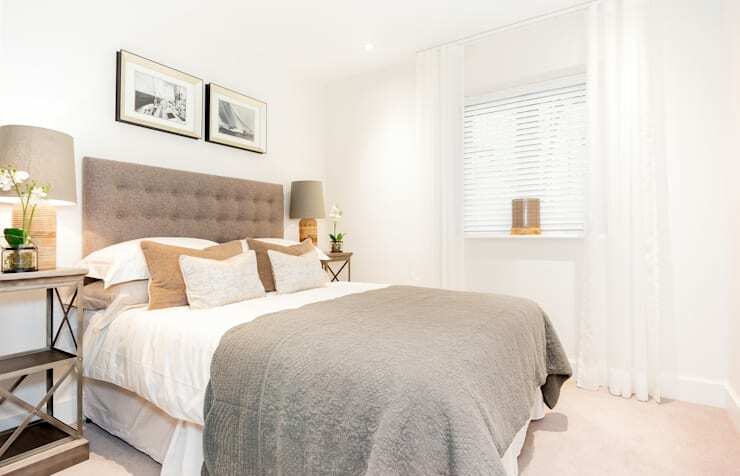 A guest bedroom has also been included, with this cosy space appearing comforting and inviting. The expanse of the white walls and ceiling is softened by the textured grey of the bed head and linens, with the entire space bathed in sunlight filtering through a simple window. Twin bedside tables and lamps balance the room, with black and white photographs included for a hint of artistry. The interior of the home isn't the only element worthy of admiration in this lovely design, with the abode situated by a serene beach, and its view incorporating the vibrancy of the surrounding parish of Swanage. 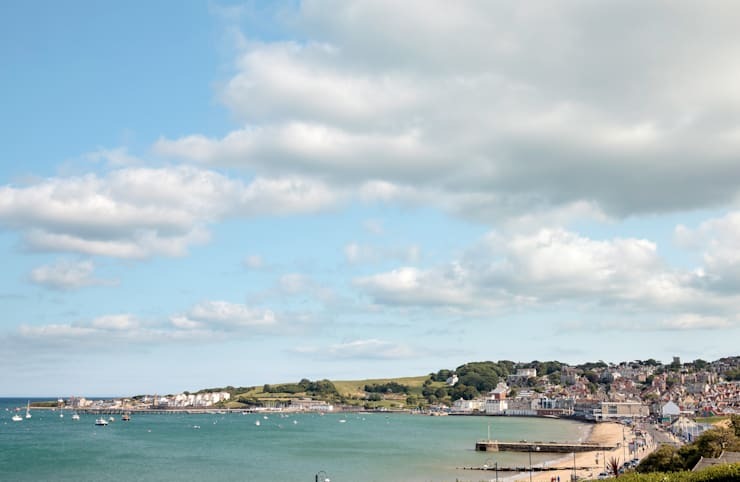 The bright colours streaming in from the seaside and village are simply gorgeous, and present the perfect locale in which to enjoy the relaxed serenity of retirement in a picturesque, rural setting. For tips on how to provide visual expansion to your humble abode have a look at these 6 ways to maximise space in your home! Would you like to have a charming seaside home to get away to and relax? Tell us your thoughts below!